BAGHDAD, Iraq (CNN) -- Iraq's former trade minister, who resigned this month amid accusations of corruption, was arrested by security forces as he was trying to leave the country, officials confirmed to CNN. 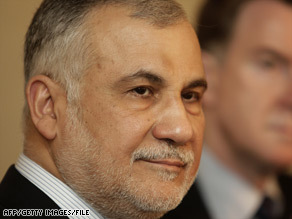 Abdul Falah al-Sudani resigned as Iraq's trade minister under allegations of corruption. Abdul Falah al-Sudani was aboard a flight to Dubai from Baghdad International Airport when police contacted the pilot and told him to fly back to the airport, Sabah al-Saedi, chairman of Iraq's parliamentary integrity committee told CNN. Al-Sudani -- arrested on a warrant issued in Samawa on Saturday -- was seized after the plane landed, al-Saedi said. Lawmakers and government officials have raised questions with al-Sudani about Trade Ministry issues: the importation of goods intended for distribution in government food rations but rejected as unsuitable for human consumption; missing shipments of food; a missing $39 million; and obstruction of justice. Al-Sudani acknowledged that his ministry has had problems with corruption but denied he was personally involved. Al-Saedi said al-Sudani didn't know that a warrant would be issued, but he was well-aware of the corruption accusations against him and had been told by lawmakers and officials not to leave Iraq.